Brooklyn Brewery beers are relatively new to Minnesota, but we know they are highly spoken of everywhere they are available. So, when we had a chance to go to a beer tasting dinner to try eight of their beers we jumped on it. Plus Garrett Oliver, Brooklyn Brewery brewmaster, author of The Brewmasters Table and now the editor of The Oxford Companion to Beer would be joining us at the dinner. To top it off, the dinner was at Haute Dish a much talked about restaurant we've been meaning to try. We were greeted with a beer we'd had before, the Brooklyn Pilsner. Just an easy drinking lighter beer. 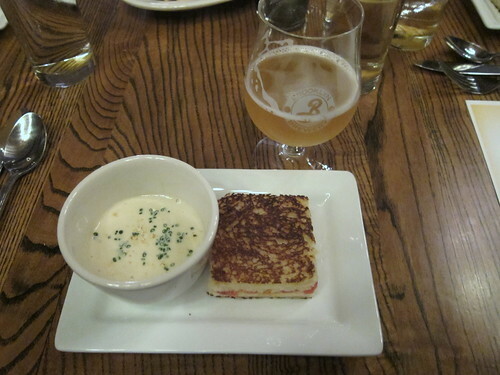 The first course was a great take on a favorite lunch, grilled tomato sandwich with cheese soup. The tomato sandwich was served on what I think was an eggy brioche adding some wonderful richness. The cheese in the soup was good and tangy. This was served with the Brooklyner Weisse, a light brisk beer that is only available on tap. It was perfect for cutting the richness of the soup. Course two was humorously called the Haute Pocket. 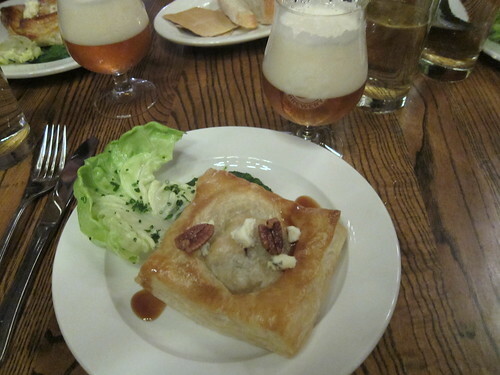 Puff pastry stuffed with tongue, cheek, root vegetables and blue cheese over a bed of mushy peas. I think there isn't much that doesn't taste good baked in puff pastry. Matt loved it! The was served with the Companion Ale, a wheat wine made in collaboration with some of the authors of The Oxford Companion to Beer. A really interesting malty ale. 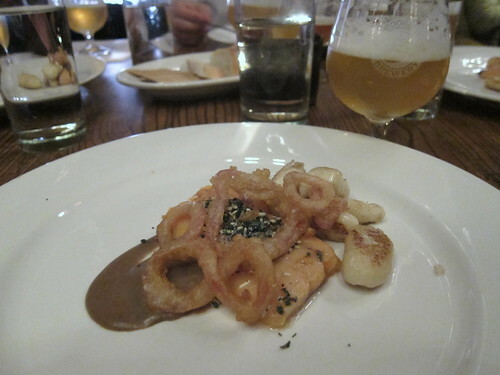 Course three was a poached artic char in a pumpernickle bread sauce, cream cheese gnocchi and pickled onion rings. The char was nice, but really it was the accompaniments that shined here. That gnocchi was as light as air and using pickled onion in rings is brilliant. The beer here was the Sorachi Ale, a slightly lemony beer made with Japanese Sorachi Ace hops. Then came the Pig and Apple course, pork belly, pork tenderloin and blood sausage served with brussels sprouts, gruyere and an apple half. At this point we were so full already, but this plate full of porky goodness was hard to resist. This dish was served with my favorite beer of the night, Local #2. This bottle fermented beer had a great fruity, caramel, chocolate flavor and reminded me a lot of the beers I liked in Belgium. Now came the first of two dessert courses, blueberry empanas over taleggio cheese with blueberry ice cream and shortbread. The empana was great, but I felt like serving it with a blueberry ice cream was kind of a waste. We would have liked to have had a great vanilla, cinnamon or even beer ice cream instead. 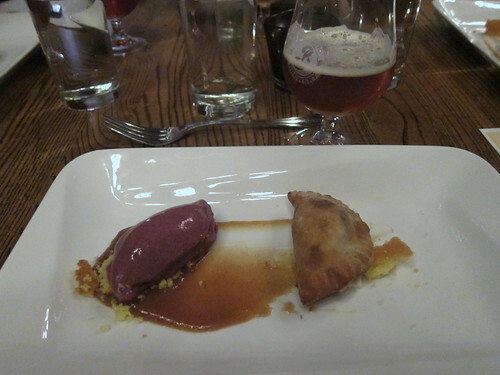 The beer served with this course was the '07 Monster, a barley wine. When I've tried barley wine in the past I haven't been a fan, but I found this one a much easier drinker. 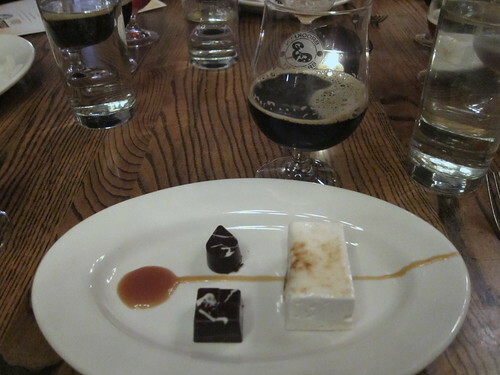 It was interesting because this was the one course that Garrett Oliver thought the beer and food did not pair very well together, though cheese and ice cream are suggested pairings. Thankfully, the final course was small two chocolate truffles with a monster marshmallow and Black Chocolate Stout ganache. Everyone loved the flavor of the homemade marshmallows, but they were tricky to eat at all politely. This was served with the same Black Chocolate Stout that the ganache was made with. Oh, do I love a good chocolate stout, to me it is dessert in a glass and perfect with the truffles. Finally, we were offered tastings of two other beers,The Concoction, a beer based on a Scotch-based cocktail called The Penicillin and combining peat smoked malt, minced ginger, lemon juice and wildflower honey or Blast, a double IPA. I had the Blast, which is odd for me as I don't usually care for the hoppiness of IPAs, but this one had a very clean hop flavor that didn't leave the aftertaste that I don't like. Only one person at our table tried The Concoction, no one else was up for it. I can tell you it had quite a pleasant lemony, spicy scent. 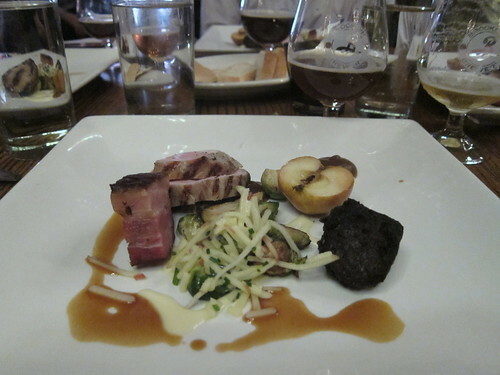 This was a wonderful beer dinner, though made for a tough Tuesday morning! We really enjoyed talking to Garrett about how they are working with brewers in places like Denmark, Sweden and Italy to create their own microbrews. We were also very impressed by Haute Dish, serving a dinner like this for a large group of people all at once can often be tricky and effect food quality, we certainly felt none of that issue with this meal. I want cheese soup! The rest of the dinner looks good too. My H loves Brooklyn Brewery! I am not a beer drinker, but this looks like quite the sophisticated pairing dinner. Sounds like a cool dinner, wish we'd been able to go. Oh wow, this is one meal that would require sleeping in the next day. Those are some hefty beers, but I'm sure they were delicious. I just love the Haute Pocket, both the name and those fillings. And blueberry empanadas? Wow. I need to make marshmallows again. That one looks so good.